A toll is a fee charged by an authority for some right or privilege, like, for example, driving along a road or in telecommunications and, in US English, the payment made for a long distance phone call. A toll is also the extent of damage or the amount of loss suffered because of something. The verb to toll is quite rare, but it means ‘to collect a toll payment.’ Unrelatedly, the verb toll is used to talk about a bell sounding slowly, in single strokes and it also means ‘to announce someone’s death by making such strokes.’ The related noun toll refers to the action of tolling or the sound of a bell tolling. 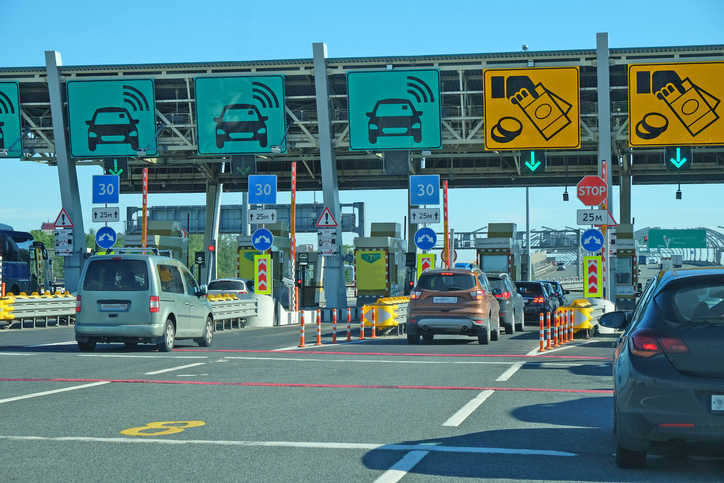 In France, you often have to pay a toll to travel on the autoroutes. If you want to make a long-distance call, you have to pay the toll. Forty-eight people have been confirmed dead in the distaster, but many others are missing and the toll is expected to rise. The new road will be paid for by tolling its users. We could hear a bell tolling somewhere in the distance. The villagers knew the old lady had died when they heard the church bell tolling. The bell ringer pulled on the rope, giving three tolls of the bell. The bell's toll echoed around the valley. In UK English, toll also used to mean ‘a group of trees.’ This meaning is archaic now, but you might still hear it in some dialects from the South East of England. Toll roads are fairly common in the US, but quite rare in the UK. Most of the places where you have to pay a toll in the UK are bridges crossing rivers, such as the Severn Bridge, which links Bristol to Wales, and the Tamar Bridge, which links Plymouth to Cornwall. Toll dates back to before the year 1000. The Old English noun toll, a variant of the older toln, is Germanic in origin, though there are two theories on its exact origin. Most linguists believe that the English toll, together with many related nouns, such as the Old Norse tollr, the Old Frisian tolen, the Old High German zol and the German Zoll, were borrowed from the Late Latin tolōnium or tolōnēum (custom house), from the Latin telōnēum (tollhouse), which in turn was borrowed from the Greek telōneîon (tollhouse) from teló̄nēs (tax colector) and télos (tax), probably from the Proto-Indo-European root tele– (to lift, support or weigh), A less popular theory, however, suggests that the Germanic terms all came from a Germanic origin, and are related to the verb tell, with the sense of something counted. The original meaning of toll, ‘a payment demanded by an authority,’ later narrowed to mean ‘a payment for passage on a road.’ The US sense related to calls was a figurative use of this meaning. The verb comes from the noun, and dates back to the early 13th century, in the form of the Middle English verb tollen. The unrelated verb, ‘to ring’ (said of a bell), dates back to the late 12th century, when the Middle English verb tollen meant ‘to entice, lure or pull’ (the sense we know now was a figurative use, since a bell is pulled towards you to make it ring, and the sound of a church bell lures people to church). It can be traced back to the Old English –tyllan, which is only found in compounds like fortyllan (to attract or allure) and betyllan (to lure or decoy), but the origin is uncertain. The transitive sense, ‘to make a bell ring,’ dates back to the late 15th century. The noun, meaning ‘the stroke of a bell,’ comes from the verb, and dates back to the mid-15th century. Toll was suggested by Nina, from France.